Cetirizine is the generic name for the brand name Zyrtec and is a medication that is used to treat moderate to severe allergies, cold symptoms or chronic hives. Cetirizine was approved by the FDA in September 1996 and was initially available via prescription only. In November 2007, the FDA made it made it available over the counter at drug stores across the US. In Canada, it is also available under another brand name, Reactine. Cetirizine belongs to the second generation antihistamine class and is similar to drugs such as azelastine (Astelin), fexofenadine (Allegra), and loratadine (Claritin). Unlike other antihistamines, Zyrtec is non-sedating. It was approved by the FDA in September 1996. Originally, Zyrtec is a prescription drug but in November 2007, the FDA has made it available over the counter. It is available in generic form as well as brand-name drug under the trade names: Zyrtec, Aller-Tec, and Alleroff. It is dispensed in tablet form (5 mg and 10 mg), chewable or orally disintegrating tablet, and syrup (5 mg/5ml). Like most antihistamine drugs, cetirizine is also available in combination with a decongestant (usually pseudoephedrine hydrochloride). This drug combination is marketed as Zyrtec-D.
Zyrtec is considered safe to use in both children and adults, and the dosage varies depending on age and weight. For small children, Zyrtec is available in both a liquid suspension and chewable tablets. The dosage of these ranges based upon the child’s weight for children less than six years of age. Adults and children aged six and older may take 10mg of cetirizine daily, but a 5mg dosage may be suitable for less severe symptoms. This lower dosage also reduces the occurrence of many mild side effects such as stomach upset and drowsiness. Zyrtec is most commonly used to treat allergies and their symptoms because of its ability to reduce the effects of histamine—a natural chemical released in the body during an allergic response. Histamine can cause watery, itchy eyes, runny nose, sneezing and a general unwell feeling. Reducing the production and effects of histamine directly reduces the symptoms it can cause. The common cold and flu viruses often stimulate the production of histamine as well, so Zyrtec is often prescribed to relieve symptoms of cold and flu. Cetirizine is also used to treat cases of chronic urticaria—or hives—when the cause of the hives is unknown because of its ability to reduce swelling and itching. If taking Zyrtec over-the-counter, be sure to read the label and take the drug exactly as directed. If taken under medical supervision, follow your healthcare provider’s instructions. Do not take more than prescribed or recommended. Zyrtec may be taken with or without food. If taking the chewable tablet, it must be chewed carefully before swallowed. If taking the oral-disintegrating tablet, it should be allowed to dissolve in the mouth before swallowed. You can drink liquid to help ingest the dissolved tablet. If taking the Zyrtec syrup, use the dose-measuring cup or spoon that comes with the bottle. If it does not come with a measuring device, ask one from your pharmacist. Avoid missing doses and take each dose around the same time of the day. Inform your healthcare provider if you have allergy to cetirizine or hydroxyzine; or any other allergies. 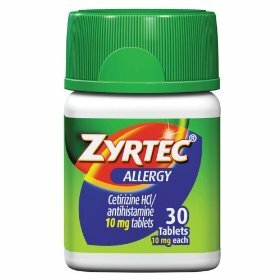 Zyrtec may contain ingredients that you may have allergy to. Discuss with your healthcare provider all allergies you have. Discuss with your healthcare provider use of this drug if you have underlying medical conditions, particularly kidney or liver diseases. Zyrtec can cause drowsiness. Avoid driving, operating machinery, or performing activities that require mental alertness. Limit or avoid intake of alcoholic beverages. If using this drug to treat hives, inform your healthcare provider of any other symptoms which may indicate more serious condition, such as unusual color of hives, blistered or bruised hives, hives that do not itch. Older adults should take this drug with caution. Watch out for side effects. Pregnant women should take this drug only when necessary and as directed by a healthcare provider. Discuss with your healthcare provider possible risks and benefits of taking this drug during pregnancy.